This video covers how to catch the smaller, slower moving bumps to connect into the bigger, faster moving swells. Guy Pere, a great paddler from Oahu, used this great analogy: use an “onramp” to pick up the speed you need to merge onto the “freeway”. Then, as you come off the faster moving swell, look for an “offramp”, a smaller bump that will keep your speed up as you come off the back of the bigger, faster swell, which allows you to maintain the glide and look for another faster moving “freeway” to merge onto, keeping the momentum going at a high average speed, this is what connecting bumps is all about. Just like merging onto a freeway, you need to accelerate on the onramp first to gain the speed needed to merge into the faster moving traffic. 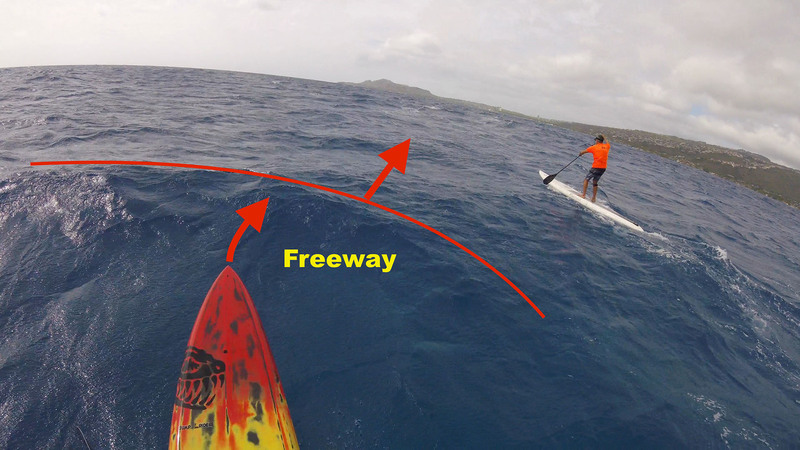 On our Hawaii Kai downwind runs, the offshore wind creates slower moving, shorter fetch, close period bumps that move to the left- the onramps. Longer period windswells and open ocean swells move more to the right and move too fast to catch without building momentum one an onramp first. It’s hard work to get longer rides on the freeways but the speed from those faster moving bumps are the reason why the fastest guys move so much faster on downwinders. This entry is filed under Downwind/Racing, Sessions, Tips. You can follow any responses to this entry through RSS 2.0. You can skip to the end and leave a response. Pinging is currently not allowed.